Feel like you’ve tried everything with no success? Tired of the little poo and pee traps laying around your house? Do you spend more time cleaning up after your puppy than playing with him? Are you spending your vacation budget steam cleaning your rugs? Bravo Fido can help fix the problem and get you back on track to success! House training is one of the big challenges to new puppy owners. Puppies are physically unable to hold for as long as we would like and are not born knowing where your ideal doggy potty is located. This makes for a messy situation! Rolled up newspapers, raising your voice or rubbing your puppy’s nose in his excrement used to be popular recommendations. Today, we know this is unnecessary and can do more harm than good! It can actually lead to something called reverse housetraining where your dog becomes afraid of pottying in front of you, making it harder to reinforce proper potty behaviour. Keep in mind puppies are just babies after all. They need more teaching and less scolding. Housetraining is labour intensive but with the right method it is virtually fool proof. Bravo Fido has been in the puppy trenches. We understand the problem and have seen the common pitfalls. How long can I leave my puppy? Should I discipline my puppy when he piddles inside? He was clean but now he is not? We can get you and your puppy on the path to success. Clean floors and fresh smelling carpets will be yours! No one wants to pick up doggy messes forever! House training may be simple when using the right method but no one ever said it would be easy. It requires vigilance, consistency and patience. Housetraining doesn’t happen overnight but relief from unwelcome messes can. There is so much misinformation out there that it can be hard to sort through. At Bravo Fido we will separate the myths from the facts for you. Did your last puppy seem to house train itself? Some dogs seem to catch on very quickly. Almost every dog owner has either had one of these or heard of the miraculous pup who was housebroken in 2 days. This can make other dogs look bad but there is nothing wrong with a pup who requires proper training. In fact, most of them do! Since it is easier to build good habits from the start than to deprogram bad ones, all puppies should start with the same plan. If you were blessed with one of those miracle pups, you will start out the same but progress faster. This sets everyone up for success! At Bravo Fido we break toilet training into 3 simple steps. Puppies can eliminate in the blink of an eye. If your full attention isn’t on your puppy, he should be contained in an appropriate area. 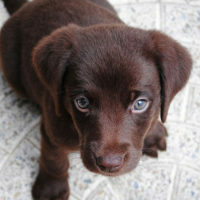 We will teach you how to set this up and give you an appropriate schedule for your puppy’s age. We are aware that some people don’t like crates for dogs, we can offer alternatives. Our idea of where a dog should eliminate is a completely arbitrary concept to a dog. Dogs will often avoid eliminating near their eating and sleeping spaces, but the formal dining room that is only used once a year is fair game. This is why it is important to reward you puppy for going in the “right” place. There are other advantages to rewarding your puppy for getting it right: you can train your dog to go on command and even within a time limit. This is particularly useful on road trips or cold nights. We will teach you how to host an effective potty party. As puppies master housetraining, we want to give them more freedom. This needs to be done carefully to set them up for success and to prevent regression. In this step, we teach your puppy to roam your house one room at a time. We will teach you how to increase freedom and what to do should an accident occur. Crates can be an excellent tool to help house train your puppy. The first step is to make the crate a safe and enjoyable place for your puppy to hang out. It will then be a powerful asset to help train your puppy. Puppy housebreaking doesn’t require the use of a crate, however, it makes it a lot easier. If you feel your dog’s crate is more of a prison than a bedroom, we can help. Pee pads can be confusing to dogs. Outside vs inside is a pretty big distinction whereas on or off the pad isn’t! If it isn’t well taught, puppies can have trouble differentiating between their toilet and other surfaces. You may end up with a dog that pees all around the house or in the vicinity of the pad but not necessarily on it. As with any aspect of house training, a solid step by step plan is key to success. There are pros and cons to using pee pads. Let us discuss them with you and pick the option that best suits your needs. Potty training relies on patience and repetition initially. Nobody enjoys standing in a blizzard, multiple times a day, waiting for their precious puppy to piddle. This can lead to owners avoiding outings or going back inside before the puppy is done which increases accidents and slows down house training. In addition, some puppies feel the cold more than others (generally short haired breeds). This can lead them to focus on going back inside and pottying in the nice warm house. Bravo Fido understands the winter puppy and his challenges. 2 hr package – includes initial consult (1hr) at your home, personalized schedule for your puppy, a progressive plan, and follow up either at home or by phone. *Basic house training is included in our all-inclusive Puppy Training package but if all you need is housetraining help for your puppy, this is for you. Have an adult dog with housebreaking issues? Sign up for an initial consultation.